The general consensus of the world’s scientific community is that global warming is occurring, and that increased emissions of greenhouse gases (GHGs) from human activities since the beginning of the Industrial Revolution (around 1750) are a leading cause. Global warming is a long-term rise in the average temperature of the earth’s climate system. 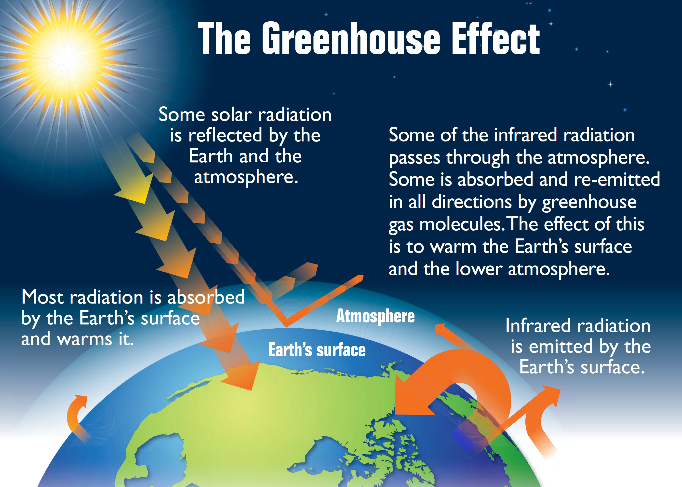 GHGs in the atmosphere contribute to global warming through a mechanism commonly referred to as, “the greenhouse effect,” whereby radiation from the sun passes through the earth’s atmosphere and warms the planet’s surface to a temperature above what it would be without the atmosphere. GHGs are radiatively active, radiating energy in all directions. Part of this radiation is directed towards the surface, warming it. Increased concentrations of GHGs increase the radiant energy directed toward the earth’s surface; thereby, contributing to global warming. The scientific community at large attributes the temperature increase to anthropogenic (produced by human activity) GHG emissions. Models have predicted that if GHG emissions continue at their current rate in 2017, the earth’s surface temperature could exceed historical values as early as 2036 – 2047, with potentially harmful effects on ecosystems, biodiversity, and human economies. Anticipated effects include rising sea levels; changing precipitation; expansion of deserts in the subtropics; continuing retreat of glaciers, permafrost, and sea ice; more frequent extreme weather; ocean acidification; and extinctions of species due to shifting temperature regimes. Other anticipated effects significant to humans include the threat to food security from decreasing crop yields and flood damage due to rising sea levels. GHG regulations affecting industry in the United States to date have primarily focused on collecting emissions inventory information for the larger sources of GHG emissions (e.g. 40 CFR Part 98 – Mandatory Greenhouse Gas Reporting). This rule requires mandatory GHG emissions estimation and reporting through the EPA Electronic Greenhouse Gas Reporting Tool (e-ggrt) from only stationary fuel combustion units and uses of carbonates from specifically identified source categories. 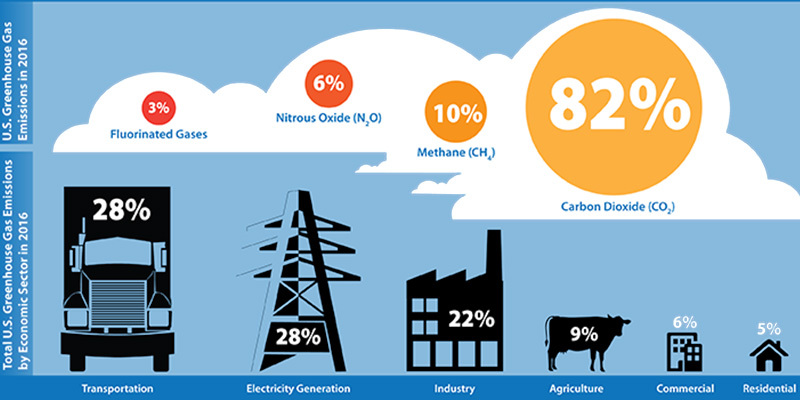 The EPA also identifies the GHG pollutants of concern and establishes Global Warming Potential (GWP) factors for these pollutants for use to calculate Carbon Dioxide Equivalent (CO2e), which is used to adjust all GHG emissions relative to a single GWP for CO2 for comparison. *See Table A-1 of rule for GWP for individual GHG. The Obama-era Clean Power Plan, put forward in 2015, was designed to reduce GHG emissions from power plants 32 percent below 2005 levels by 2030. The Trump administration’s replacement Affordable Clean Energy rule unveiled in August 2018 only aims to cut carbon dioxide emissions from 2005 levels by 0.7 to 1.5 percent by 2030. In 2012, the Obama administration put forth a major regulation on GHG pollution from vehicle tailpipes, requiring automakers to nearly double the fuel economy of passenger vehicles to an average of about 54 miles per gallon by 2025. In August 2018, the Trump administration published a proposal designed to freeze average fuel economy standards after 2021 at about 37 miles per gallon. On December 12, 2015, parties to the United Nations Framework on Climate Change (UNFCCC) reached a landmark agreement to combat climate change and to accelerate and intensify the actions and investments needed for a sustainable low carbon future, commonly known as, “The Paris Agreement.” 195 countries have signed the agreement, as of November 2018, agreeing to determine, plan, and regularly report on the contribution it undertakes to mitigate global warming. President Barack Obama pledged the United States would cut carbon at least 26 percent below 2005 levels by 2025. In June 2017, President Donald Trump announced his intention to withdraw from the agreement. Under the agreement, the earliest effective date of withdrawal for the U.S. is November 2020, shortly before the end of President Trump’s current term. In practice; however, changes in United States policy that are contrary to the Paris Agreement have already been put in place. Although it appears that federal regulatory drivers for reducing GHG emissions may be placed on hold for now, the political pendulum which swings in one direction inevitably swings back the other direction at some point in the future. There are also other drivers that could focus interest on GHGs for industrial facilities, such as global marketability, Industrial Standards Organization (ISO) certification, and/or state/local programs. It would be a good idea for facility managers to at least incorporate GHGs into their next emissions estimation efforts, if a GHG inventory does not already exist, regardless of which side of the climate change debate they stand on. EI professionals have extensive expertise developing emissions inventories for multiple purposes, including GHG reporting, air permitting, compliance certifications, and fee reporting. For more information, please contact me at (919) 459-5229 or mcramer@ei1.com.